Firstly, my apologies for anyone reading the Turkish Torte Recipe on my blog earlier today, and finding that it has disappeared now. I had a bit of an IT disaster and some of my blog vanished into cyberspace! I have lost the whole of my Torte recipe and promise to re post the recipe later this week when I have time to work on it again. All I have left of this blog is the remains of the torte in my fridge and those remains are soon to disappear as I indulge myself from the loss of my blog. I have blogged on My Bearded Pigeon's cushions on my Etsy page - Hand picked by me! 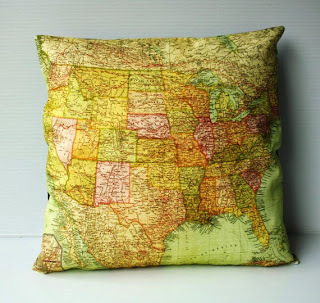 Please click on the cushion below to take you to my blog where I have more pics and details about these unique cushions depicting old maps of the world.